Two things I’ve been thinking about lately. Variation in Anscombe’s quartet despite nearly identical summary statistics. John Kruschke at “Doing Bayesian Data Analysis” has a terrific example of how to fit robust regressions through these lines using BUGS, along with links to additional code from Rasmus Bååth. It is definitely worth taking a look at these. 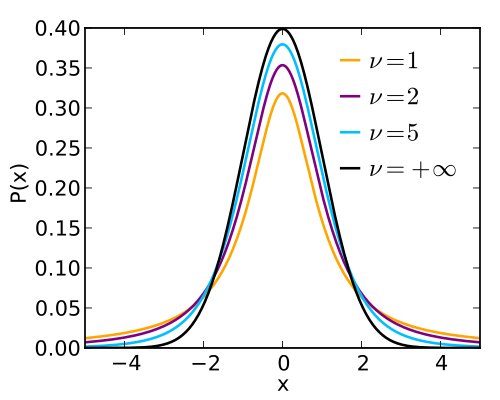 One of the key points is that for small sample sizes, where the population SD is really unknown, it is worth modelling data from a Student’s t distribution as opposed to a normal distribution, as it allows for more flexibility in outliers (such as in y3-y4 above). These are easy to implement in BUGS and Stan. If you run the code in R you will see that both models recover the estimated effects of x1 on y1 but that y2 has 3X larger error estimates around this effect. The resulting R2 is ca. 1/5 that of the y1 model. Does this mean the model is a poor fit? Not really… It speaks much more to the fact that the predictive power of the y2 model is diminished and there are wider prediction intervals, rather than there being anything wrong with the mean estimate of x1 per se. I’d be curious to hear what others make. Finally, I thought we should drop a mention of the student blog PLANeT, run by our Part II undergraduates. It’s worth checking them out! They regularly post well written and engaging articles on the relationship between plants and society. Our University colleague Professor Sir David Spiegelhalter has written a brief opinion piece in the latest issue of Science on the future of probabilistic models, particularly for big datasets (think images or genomes). (1) Statistical problems have shifted from many observations (large n) and few parameters (small p) to small n and large p, creating pitfalls when testing large numbers of hypotheses. This is because the standard “p-value”, which we’ve griped about in the past here, will declare 1 in 20 non-existent relationships “significant” simply by chance. So procedures are needed to reduce false discoveries. The bit that I didn’t really follow was why even bother minimizing false discoveries? Wouldn’t an interpretation of effect sizes be more meaningful? (2) Inferring causation from observational data will continue to be a challenge, especially when n gets cheap and p remains large. Statistical theory to deal with causality will be needed more than ever, and thankfully, it is improving. This is something we’re quite fond of having thought a fair bit about causality in the context of path analysis, structural equation modelling, and directed acyclic graphs (see our J Appl Ecol paper that just came out). The problem, however, is that these approaches don’t come easy and I struggle to see how they can be used by non-statisticians (the models in our paper took years of faffing!). Finding ways to make causal inference more accessible is going to be critical in the future. Oikos kindly featured our latest paper. See below! Bimodality – the characteristic of a continuous variable having two distinct modes – is of widespread interest in data analysis. This is because, in some cases, we can use the presence or absence of bimodality to infer something about the underlying processes generating the distribution of a variable that we are interested in studying. In ecology, tests of bimodality have been used in many different contexts, such as to understand body size distributions, functional traits, and transitions among different ecosystem states. But a lack of evidence for bimodality has been reported in many studies. Our paper “Masting, mixtures and modes: are two models better than one?”, now shows that a widely-used statistical test of bimodality can fail to reject the null hypothesis that focal probability distributions are unimodal. We instead promote the use of mixture models as a theory oriented framework for testing hypotheses of bimodality. Dealing with non-normal data: are you skewed? I was recently trying to model some data from a normal distribution but the data were right-skewed. No amount of transformation could eliminate this. In the past, I’ve dealt with this by using the skew normal distribution. But rather than match distributions to data, we should be asking whether skewness makes sense (in our case) biologically? There has been good reason to expect this in some cases, such as where environmental filters might push a trait into a certain direction. But what about where there isn’t a good rationale for skewness? Why might it arise and what can we do about it? This is where the old Student’s t-distribution comes in. The t-distribution has a bell shaped curve just like the normal but it has heavy tails that become shorter as the ‘degrees of freedom’ parameter ν approaches infinity. He’s even gone so far as to say that we should always be defaulting to t-distributions but that it hasn’t permeated practice because of computational issues. He predicted these would be eliminated with our saviour Stan. In fact, you can use t-distributions in JAGS. The real problem that I’ve had with the t-distribution is that it requires a value for the degrees of freedom ν. I wanted to estimate this because its ‘true’ value should really be unknown despite my 8 observations. And this can be difficult in a Bayesian context because of the prior we place on ν. After some reading and fiddling, I found that the recommendation of Gelman and Hill from pg 372 of ARM (and described here) worked well and converged onto a relatively tight posterior for ν despite the uninformative prior. I think I’ll be using this approach a lot more when I have small sample sizes!